Malcolm F. Reed, Col., Company Commander, Company 318, Camp NF-1, Pigeon, Pennsylvania & Company 2319, Camp ANF-13, Sheffield, Pennsylvania & Company, 2312, Camp SCS-9, Goldsboro, Maryland - Colonel, United States Army Reserve, U.S.A.A.F. Colonel, United States Army Reserve, Between Wars, Supply Officer, Gander Air Base, Newfoundland, Middletown, Air Depot, Pennsylvania, WWII, U.S.A.A.F. Malcolm Ferra Reed was born in Roanoke, Virginia on August 5, 1901. He quit school after the 8th grade and worked as a clerk in his father's freight claims office at the general offices of the Norfolk & Western Railroad in Roanoke. At the age of 16, during the closing months of World War I, he joined the Virginia National Guard "to serve for the emergency" in Company B, Jo Stern Battalion in Roanoke. He served only 3 months before being discharged to enlist in "US Service." On October 29, 1918, the day after his discharge from the "Virginia Volunteers," he was inducted into the United States Marine Corps, two and a half months after his 17th birthday. The war ended while he was in basic training at Camp LeJeune, NC; however, he completed basic training and serviced as an MP until his discharge at the Marine Base at the Norfolk Naval Yards. On January 26, 1922, he enlisted again in the Virginia National Guard and served as mess sergeant with the 416th Company of the 1st Coast Artillery Corps. He attended six months of ROTC training at the Virginia Mailitary Institute and on August 14, 1923 he accepted a commission as a 2nd Lt. in the 416th Coast Artillery Corps. Later that year he married and during the next ten years he remained active in the VANG. On October 17, 1925, he accepted an appointment as a 2nd Lt. in the Officer's Reserve Corps. He was promoted to 1st Lt. in the Coast Artillery Corps, VANG on August 22, 1928 and was assigned to Battery H of the 246th CAC. On April 29, 1930, he transferred to the Coast Artillery Reserve of the VANG and moved his family to Pittsburgh, PA, which by then had grown with the birth of a daughter and son. Another son was born there in November 1931. On October 31, 1931, while living in Pittsburgh and working with the IBM Corporation, he was appointed to 1st Lt. in the Coast Artillery of the Army of the United States. Shortly thereafter, on November 2, 1931, he accepted an appointment as 1st Lt. in the Reserve Officers' Corps (ORC). He remained in the ORC until May 31, 1944 when he was appointed to the Army of The United States (AUS). 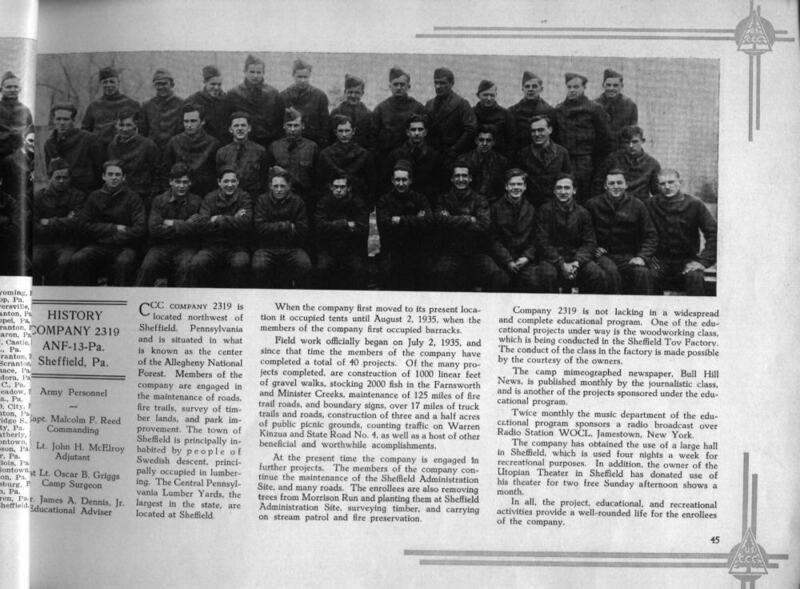 The Civilian Conservation Corps was authorized by an Act of Congress on March 31, 1933. On April 23, 1933, 1st Lt. Malcolm F. Reed was the second US Army officer to be called to active duty to serve with the Civilian Conservation Corps. 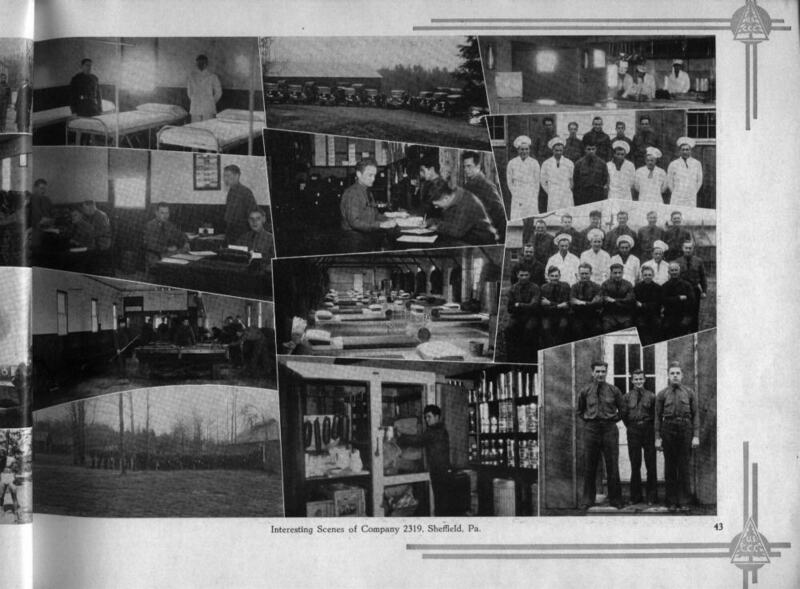 He moved his family to Duhring, PA and established the second camp in the United States at a place called Pigeon, PA.
On April 25, 1933, temporary tent emplacements were being installed at Camp ANF-1, Company 318 at Pigeon, PA. By the time winter came that year, 3 barracks and a mess hall had been constructed. Before the winter of 1934 came, 3 more barracks and the camp garage had been constructed. On November 14, 1934, 1st Lt. Malcolm F. Reed was promoted to Captain. On June 26, 1935, Capt. 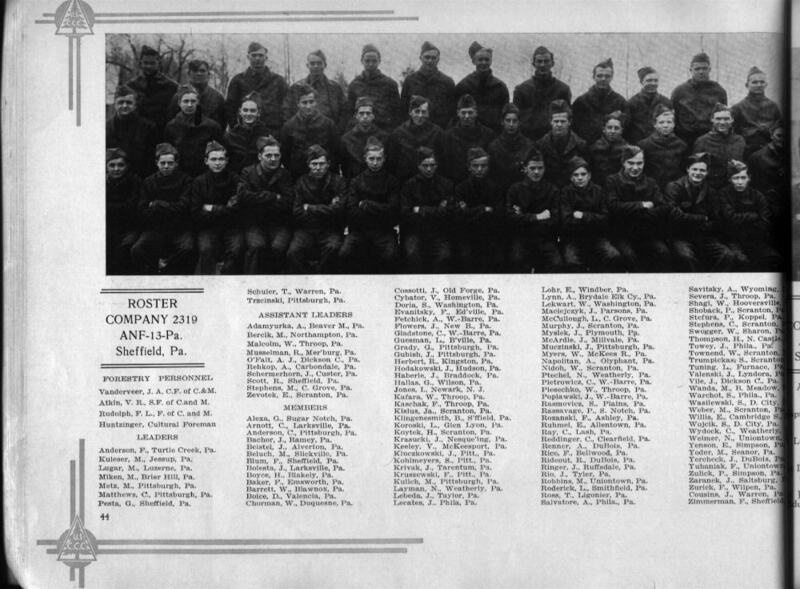 Reed and half of company 318 move to a site northwest of Sheffield, PA and established Camp ANF-13, Company 2319. Tent emplacements were constructed which the men occupied until Barracks were completed on August 2, 1935. Capt. Reed remained as company commander until April 22, 1937 when his period of active duty ended and he entered into civilian life and the Coast Artillery Reserves. On June 6, 1938, he was again called to active duty and was sent to command Camp SCS-9, Company 2312 near Goldsboro, MD. On July 22, 1940, he was sent to Ft. Monroe, Virginia for active duty training which lasted until August 3, 1940. On August 19 he was ordered from duty as CCC Company Commander received orders to enter active duty with the US Army Air Corp. He was assigned to Langley Field, Virginia as Base Supply Officer. Special Orders 196, issued at Air Base Headquarters, Langley Field, Virginia on August 21, 1941, specified that the 147 officers and enlisted personnel of the Detachment Air Base Group, the Chemical Warfare Service, the Airdrome Platoon, 446th Ordinance Company and the Detachment Medical Department would depart by rail to arrive at the New York Port of Embarkation on or about September 2, 1941. The 36 officers and enlisted personnel of the 1st Signal Platoon were to depart by motor convoy. Capt. Reed along with T/Sgt. William G. Ziletti, PFC Perry M. Kriss, PFC Vincent V. Reyrat and Pvt. Amos F. Eves, Jr. traveled by air to Newfoundland's Gander Air Base as the advance echelon. 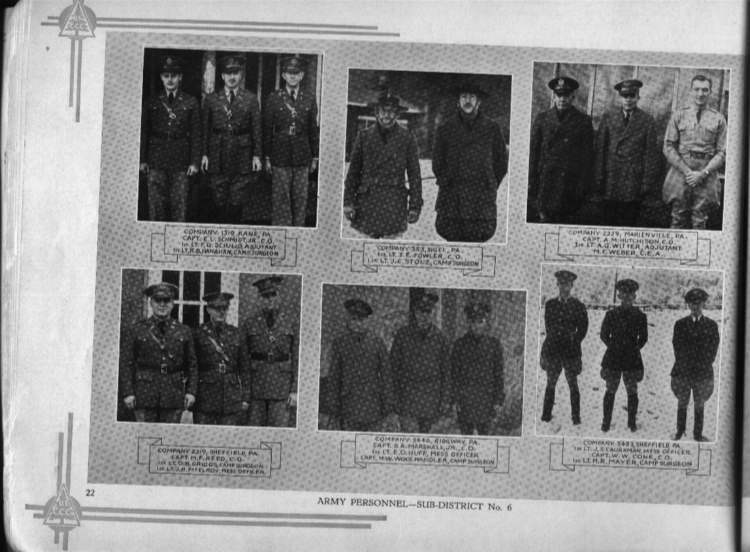 The purpose of this movement of personnel and equipment was to inventory the property of the 21st Reconnaissance Squadron, based at Gander, and for a permanent change of station. On October 29, 1941, he was promoted to major while serving as Base Supply Officer at Gander Air Base. On March 24, 1942, while on temporary duty at another base in Newfoundland, he sustained an injury after falling through the ice on a pond at that base. This injury ultimately necessitated his transfer to Tilton General Hospital at Ft. Dix, NJ for treatment and observation. He remained there between May 5, 1942 and June 12, 1942. Although the injury gave him problems for rest of his life it did not prevent him from continuing his service in the US Army Corps. After being released from Tilton General Hospital, Major Reed was transferred to Middletown Air Depot, PA. Middletown was one of the bases in the First Air Corps Air Service Command. He was assigned to the Supply Division as Chief Purchasing and Contracting Officer. He was later assigned to Property Accounting Officer and Chief Control Section, Supply division. On August 16, 1943, he was promoted to Lt. Colonel, AUS and the following spring became Assistant Chief, Supply Division. He served in that capacity until April 25, 1945 when he was assigned to Chief Supply Division. On June 5, 1945, he was promoted to full Colonel. After the war ended, he was relieved of his duties and on October 30, 1945 and moved his family back to Roanoke, VA where he was separated from service on March 3, 1946. He worked for the Veterans Administration in Roanoke until he retired from government service in 1953. Colonel Malcolm F. Reed, USAAF, retired, died on July 9, 1975 at the age of 73.